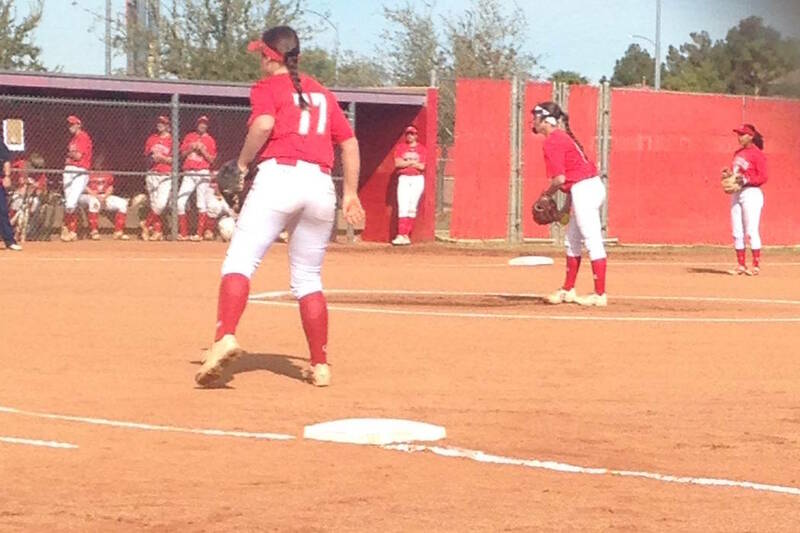 Annie Finch’s single over a drawn-in outfield scored Makena Strong with the winning run with no outs in the bottom of the ninth inning to lift Arbor View to a 6-5 softball win over Coronado. Arbor View had plenty of chances to put away visiting Coronado on Saturday. Annie Finch made sure the Aggies finally cashed in. Finch’s single to left field over a drawn-in outfield scored Makena Strong with the winning run with no outs in the bottom of the ninth inning to lift the Aggies to a 6-5 softball win over the third-ranked Cougars. Strong led off the bottom of the ninth with a flare down the right-field line that was misplayed into a triple. Finch, who helped force extra innings with a rally-starting double in the seventh, followed with the winning hit. The Aggies (9-3) led 4-1 after six innings and probably should have been ahead by more, but misreads on a bunt and a flare double to left center cost Arbor View runs early in the game. Coronado (10-6) rallied in the seventh, scoring once on Ashley Ward’s double and twice on Tori Jones’ two-out flare to left that rolled for a triple. Pinch runner Isabella Ortiz scored the go-ahead run for Coronado when Aleah Baldonado’s fly ball to center field was dropped. But Arbor View responded in the bottom of the seventh. Finch hit a soft liner to right field that rolled for a double, and Taylor Day singled up the middle to score pinch runner Kaylea Patridge. Finch finished 3-for-5, and Strong, Trinity Brandon, Micaela Resler and winning pitcher Kylie Sharapan had two hits apiece for Arbor View. Paige Sinicki was 3-for-5 with a triple, and Kaila Angel went 2-for-5 with two doubles for Coronado. 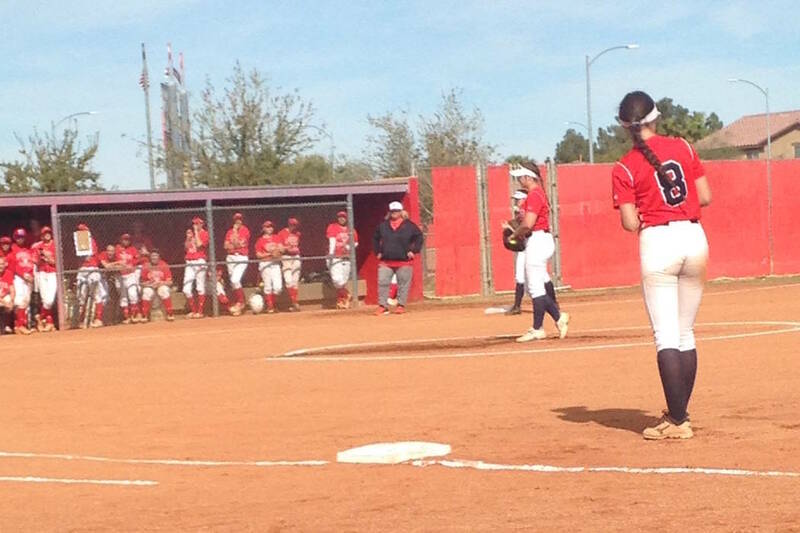 Bishop Gorman 10-7, St. Joseph (Calif.) 9-17 — At Gorman, Hayley Coreas hit a two-run single with one out in the bottom of the seventh to cap a six-run rally as the Gaels won the opener. Katelyn Hunter was 2-for-3 with a home run and three RBIs for Gorman. McKenzie Barbara was 2-for-3 with one home run for the Jesters, who led 9-4 going to the bottom of the seventh. In the second game, Nina Weldon was 4-for-4 with two doubles and three RBIs as St. Joseph earned a five-inning win to salvage a split. Arianna Jalomo was 2-for-3 with a double for the Jesters. Sydney Schafer was 2-for-2 with a grand slam, a triple and five RBIs for the Gaels. Mia Weckel and Hunter each went 2-for-3 with a double for Bishop Gorman.